A worried mother rushes into a high school. Her daughter is waiting in the principal’s office, wearing a uniform splashed with paint, the inevitable proof of bullying. Restraining her emotions, the mother speaks to her daughter with a bright smile: “Which one is your favorite color?” she asks. The daughter says it is light blue; the mother likes nothing but red. This explains kind of film that Ryota Nakano has made as the following to his acclaimed dramedy Capturing Dad four years ago. Her Love Boils Bathwater is an exhilaratingly humanistic and optimistic drama that celebrates the positive notes of our lives. Nakano’s commercial film debut, it is playing in the Japan Now section at 29th TIFF, proving that he is an up-and-coming Japanese auteur. As is often the case with the director, characters are allowed to perform as the driving force of the narrative, and in this film, Rie Miyazawa plays the indelible role of the mother who holds together the entire family. Writing the original script himself, Nakano’s trademark offbeat humor is present in abundance, but this time, so is a tender sentimentalism that will have audiences in tears, along with the laughter. Futaba Sachino (Miyazawa) owns a bathhouse that has been closed since her husband evaporated like hot water. Since then, the confident and cheerful single mother has managed to sustain a fairly rosy life with daughter Azumi (Hana Sugisaki). But then one day, she is informed that she has only two months to live. Her terminal disease ignites in Futaba a vigorous kineticism, as she tracks down the missing husband, Kazuhiro Sachino (Joe Odagiri), empowers Azumi to defy the bullies, attempts to commune with a daughter-in-law, and above all, sets to work reopening the bathhouse. Just as professionally as she boils the bathwater, Futaba directs her family’s life. Nakano adroitly but discreetly plays with color in the film, surrounding her family in the mother’s favorite red, and Azumi in light blue. Although his latest feature can be categorized as an unconventional family drama, but Nakano’s family values lead him to depict family as a sort of community, like sharing bathwater with strangers. His message is that non-biological relationships can work as long as they are maintained by the right person and for the right reasons. Nakano appeared at a Q&A session right after the film’s screening at TIFF on October 27, with Kohei Ando, the section’s programing adviser. 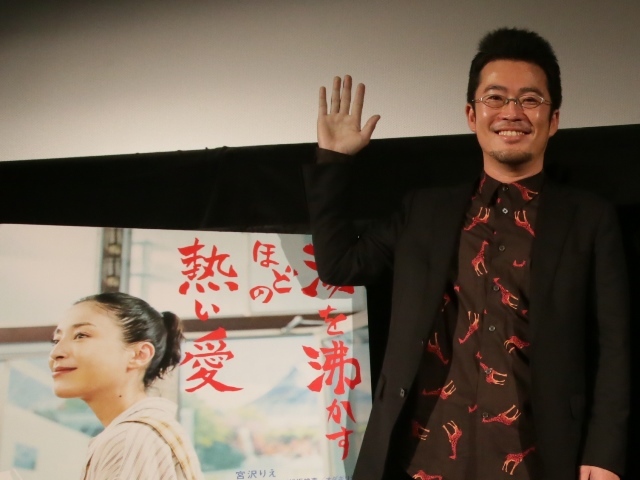 Ando teased him that the title seemed “too direct and rather tacky” when he heard it for the first time, but that was fully converted after watching the ending of the film. Her Love Boils Bathwater will open in Japanese theaters on October 29.